The thrilling intergalactic adventures of four kids in space�as told by Chorkle, a hilarious alien! It all happened because of Feeney�s Original Astronaut Ice Cream. Those accursed pink bars entranced me with their sugary magic! But I digress . . . Life on Gelo was fine until the fur-headed �humans� arrived. They invaded our peaceful asteroid with their loud drill machines and their endless greed, stealing our precious Iridium to take back to their weird looking blue-and-green planet. Then the mothership took off and four little hair-heads were marooned here. But thank Jalasu Jhuk that Hollins, Becky, Nicki, and Little Gus are actually pretty cool. They have awesome gadgets like hologram games and rocket bikes, and they can pilot starships! But there�s plenty the juvenile humans don�t know, like how to fight a ferocious thyss-cat or ride a giant usk-lizard. They�re decidedly terrible at dealing with my stink-gland. Luckily the Earthlings have me, Chorkle, and all five of my eyes to look after them. If only I knew how to help them get back home . 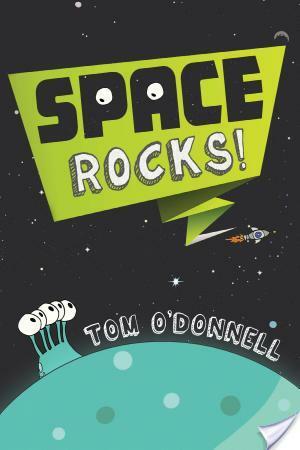 . .
I’d like to welcome Tom O’Donnell, author of the super fun looking middle grade book SPACE ROCKS! to Good Books And Good Wine today. As many of you know, I love driving, whether it is my car or a starship. Tom has been kind enough to share a playlist for piloting a starship, hope those of you who have to travel somewhere give it a listen! At first, I thought about coming up with a playlist of the songs I listened to while writing my humorous middle-grade sci-fi novel, Space Rocks!. But then I realized that all those �songs� were wordless �space ambient� music. If you�ve never heard any space ambient, imagine a fuzzy, seven-minute long version of the Apple start-up noise with the sound of water dripping over it (and maybe a little didgeridoo thrown in for good measure). Personally, I�ve never been able to write and listen to music with lyrics at the same time (I just end up typing the lyrics) so ambient music is a great way for me to set a tone in my head. But trying to force other people to listen to it seems like an act of malice. Instead I have compiled a practical playlist for actually piloting your starship: Songs to get you pumped up for plotting a course, firing your thrusters, and blasting off into the cosmos. A few�like RJD2 and Janelle Monae�are here to give you a chill, spacey vibe as you�re cruising past the ice chunks of the Kuiper Belt. And at least one of these songs is an insane (awesome) science-fiction Christmas carol which posits that the whole nativity scene can actually be explained with UFOs. Thank you, Chris de Burgh. Also, just like the universe itself, this playlist begins and ends with Queen. Enjoy! Listen To This Playlist on YouTube!